With the Supreme Court taking interest in their renovation and protection, the Katas Raj temples, one of the oldest Hindu religious sites in Pakistan, are in the news again. Situated within embrace of the Salt Range near Kallar Kahar, Punjab, this splendid complex of temples dedicated to Ram, Hanuman and Shiva is laid around a natural pond. The pond, the faithful believe, was created from a teardrop of the weeping Shiva as he flew across the sky carrying the dead body of his wife Sati. He shed two tears, one creating this pond, the other falling and making a pond in Ajmer, Rajasthan. The Pandavas came to this place during their exile, the legend goes, and built some of the older temples. Historical records suggest many of the temples, constructed in the Kashmiri architectural tradition, came up in the 11th century CE, when this region, along with parts of Punjab, fell under a Kashmiri kingdom. Katas Raj is not just a scared Hindu site, though. A little distance from the pond are the remains of a gurdwara which Guru Nanak is believed to have stayed in during his journey around the world, visiting shrines associated with different religions. Adjacent to Ram’s temple are the remains of the haveli of Hari Singh Nalwa, the most famous general in Maharaja Ranjit Singh’s army. Behind the haveli are the partially excavated remains of a Buddhist stupa, originally a temple complex that was appropriated when the Subcontinent came under the sway of Buddhism during the reign of Emperor Ashoka. In the 11th century, Al-Biruni, the famed Muslim scholar who introduced Hinduism to the West, is believed to have spent time here, studying Hinduism. Yet, for much of Pakistan’s existence, Katas Raj was lost to obscurity. In 2005, former Indian deputy prime minister LK Advani visited the temple, prompting the government to renovate the shrine. Since then, it has been a barometer of India-Pakistan relations. As the Pervez Musharraf regime went about repairing ties with Delhi in the mid-2000s, Katas Raj was well looked after and Indian pilgrims were encouraged to visit for the Shivratri festival. The flow of the pilgrims dwindled as the India-Pakistan relationship deteriorated in the wake of the 2008 Mumbai attacks. Then, early this year, then Prime Minister Nawaz Sharif visited Katas Raj and ordered its renovation, bringing the site back into public discourse. In many ways, Katas Raj’s history reflects Pakistan’s evolving attitude towards its Hindu heritage. After Partition, while ancient Buddhist sites were preserved, and promoted, as part of the country’s rich history, the Hindu heritage was ignored as the trauma of Partition and the quest for shaping an identity distinct from Hindu India animated the national narrative. During the wars of 1965 and 1971 with India, members of the Hindu and Sikh communities were attacked. In 1992, after the demolition of the Babri Masjid in Ayodhya in India, many Hindu temples in Pakistan were destroyed. This state of affairs started to change in the 21st century with a military dictator trying to shape a national ideology of enlightened moderation. As the world’s gaze settled upon Muslim fundamentalism in the wake of 9/11, Musharraf was eager to promote a soft image of the country. The first large-scale renovation of Katas Raj in 2005 took place in this context. It was a paradigm shift: after decades of silence, the country’s Hindu heritage became part of the public discourse. In Islamabad, the model village of Saidpur was restored and its Hindu temple and Sikh gurdwara renovated. Several restaurants opened in the village as tourists flooded in. The inside of the temple was painted and its structure strengthened, but an idol was conspicuously missing. For all the talk about enlightened moderation, the country was perhaps still not ready to embrace its Hindu heritage without reservation. The temple was acceptable as long as it was muesumized, keeping it at a certain distance so as not to challenge the agreed upon concepts of national identity. Placing an idol would have brought the temple alive, threatening the notion of exclusive Muslim citizenship. It had taken over 50 years to even talk about renovating Hindu temples, but the renovation was to happen in a context that was still otherized – a reminder of our past but unacceptable in our present. This is the story of Katas Raj as well. Recently, hearing a suo moto case about the drying up of the sacred pond, Chief Justice Mian Saqib Nisar asked officials of the Punjab government why there were no idols at the temple complex. The pilgrims were expected to bring their own, the officials responded. It was a reminder that despite owning up the temples, Pakistan continues to otherise its Hindu heritage. 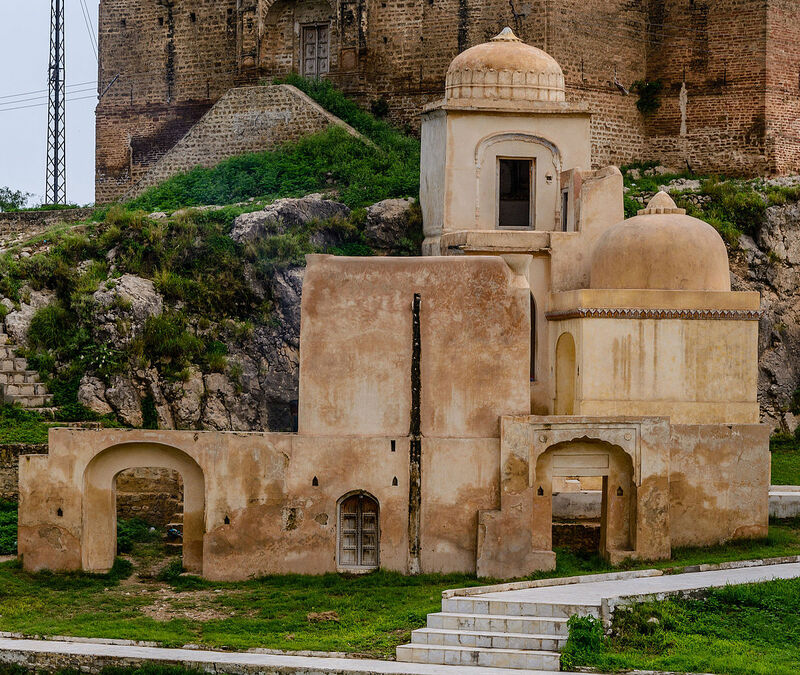 For the officials, Katas Raj was not a living place of worship, sacred to millions of people, but merely a monument of historical and archaeological significance. Its renovation thus involved an intellectual distancing from the process, necessary for appropriating Hindu heritage into Pakistani heritage. The Supreme Court’s interest in the preservation of the Katas Raj temples is, therefore, a step in the right direction. In the past decade, the Pakistani state has found it acceptable to talk about renovating and protecting historical Hindu temples. But is it prepared to let them be places of worship as well? This entry was posted in HINDUISM, HINDUISM - News, LATEST NEWS, LATEST NEWS - News, PAKISTAN, PAKISTAN - News. Bookmark the permalink.